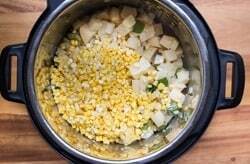 If you can find freshly picked corn to make your pressure cooker corn chowder with that will give you the sweetest flavor of all, but frozen corn will work too if corn is out of season. 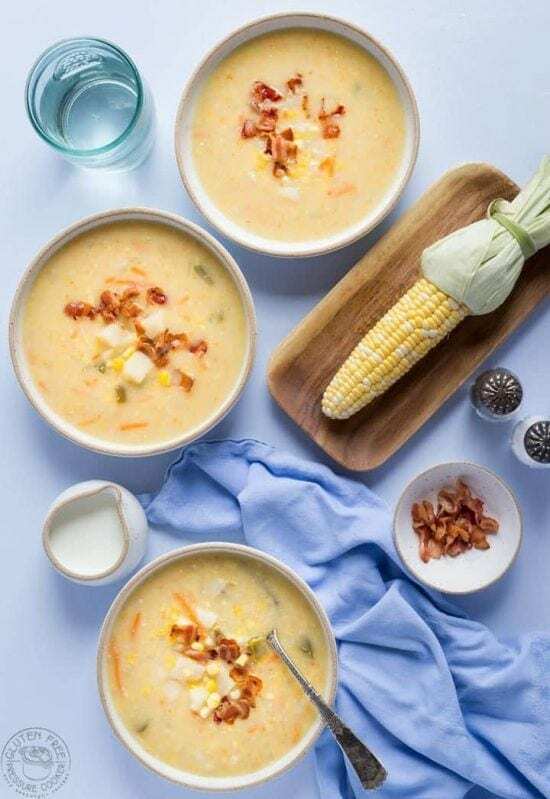 Corn Chowder is a classic American recipe that is similar to New England Clam Chowder, but in this case the clams have been replaced with corn. It’s traditionally made with fresh shucked corn and the corn cobs are then cooked in the soup to give some added flavor to the broth. 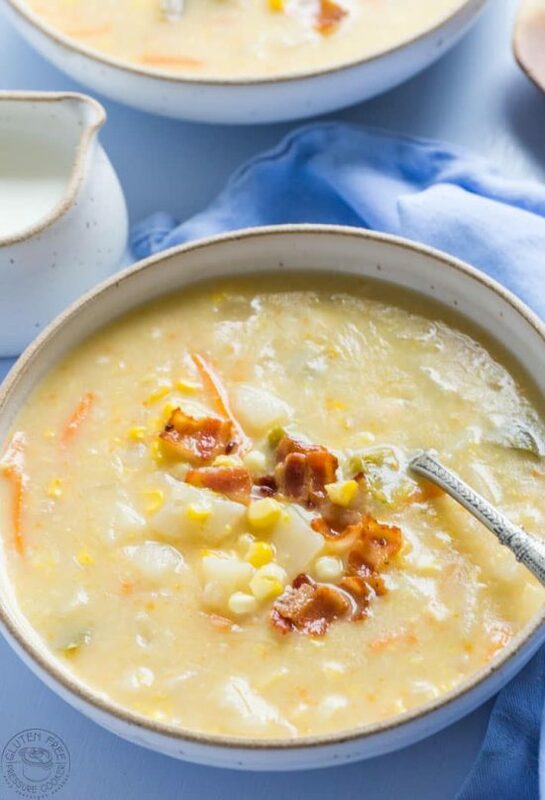 Traditionally this soup would include onion, celery, milk or cream, in addition to the corn. I’ve omitted the celery and added green bell peppers and substituted canned coconut milk for regular milk to make it dairy free. You can’t taste the coconut flavor incase you are wondering! If you are not dairy free you can use half and half instead to get that creamy texture. I’m sure there are many ‘authentic’ corn chowder recipes out there, but I make no such claim for mine! It’s delicious comfort food though and I think you’ll love this pressure cooker version. The first step is to remove the corn from the husks, I use a corn stripper to do it as its much easier than using a knife. Keep the cobs as we will add them to the soup for extra flavor. Then add the chopped bacon to a large skillet, in batches if you need to, and cook until crispy then drain on paper towels. If you want to cook it in your Instant Pot, turn on the saute function and adjust the setting to a medium heat. We will keep the bacon to garnish the finish soup. Keep about two tablespoons of bacon grease, you’re going to use it for cooking the onions and green pepper, it will really amp up the flavor of the soup! Then, Add the broth and the corn cobs to the top of soup mix and immerse them if possible, this will add more flavor to the soup. Lock the lid and cook according to the recipe below. I like to blend half of the cooked corn chowder to give it an overall smooth texture but still have chunky bits in it. You can serve it garnished with the bacon you cooked earlier, it’s very tasty! 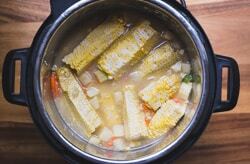 Like this Pressure Cooker Corn Chowder Recipe? You’ll LOVE these!! 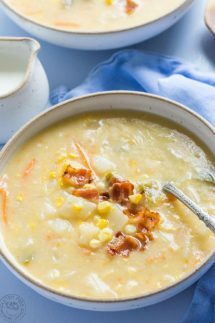 If you enjoyed my pressure cooker corn chowder then I know you’ll love my other gluten free Pressure Cooker recipes that are very easy to make. One of our family favorites is my Instant Pot Chili, it’s got a really rich flavor and has been specially adapted for the pressure cooker. My Instant Pot Firecracker Chicken is another quick and easy option, it’s very easy to adjust the heat levels to suit all tastes. my Pressure Cooker Pot Roast, it’s on regular rotation on our monthly menu and is one of my most popular posts! 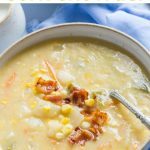 My Instant Pot make perfect Pressure Cooker Corn Chowder, it's draws out the natural sweet flavor of the corn! You can cook it in only ten minutes. Watch my recipe video before you start! It's right below the directions. If you're using fresh sweetcorn, remove the silks and when you have cut the corn from the cob, keep the cobs as you're going to add them to the soup. Cook the bacon in a couple of batches until crisp in a large skillet, and then drain on paper towels. If you want to cook it in your Instant Pot, turn on the saute function and adjust the setting to a medium heat. 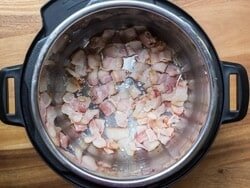 Keep 2 tbsp of bacon grease and add it to your Electric Pressure Cooker. 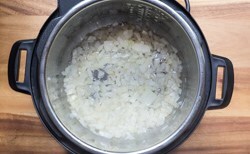 Turn on the saute setting and adjust it to the medium heat setting, then add the chopped onion and green pepper and stir for just a minute, then turn off the saute function and stir in the cornstarch. Add the salt, pepper, garlic, carrot, gluten free chicken broth, potatoes, sweetcorn and thyme to your Pressure Cooker and stir well to combine. Add the corn cobs to the top of soup and immerse them if possible, this will add flavor to the soup. Lock the lid, turn the steam release vent to 'sealing' and using the manual setting, adjust it to cook for TEN minutes at High Pressure. When the cook time time is up, allow the unit to reduce pressure on its own without opening the steam release vent (Natural Pressure Release, or NPR) for about SEVEN minutes, then you can gently release the rest of the pressure by opening the vent. Carefully remove the corn cobs from the soup. Add half the soup to a blender or food processor and blend until smooth, then pour it back into the remaining soup and stir well to combine. Add the canned coconut milk or half and half and stir again. Serve garnished with the bacon bits you cooked earlier. This was a really nice chowder recipe and I’m glad you gave a dairy free option, my son can’t have dairy. I served it to people who normally eat dairy and they couldn’t tell the difference, I’m glad you liked it!